Powers/Abilities: The Ape Lords have human level intelligence, dexterity, etc. They have superhuman strength, speed, and agility, and possibly enhanced olfactory senses, etc. They are reasonably skilled with weapons of war, such as spears, catapults, etc. Ape Lords in the Hyborian era were not shown to speak or demonstrate acts of intelligence. Possibly these acts were just not shown, or perhaps their intelligence had markedly dwindled over the millennia. Traits: The Ape Lords loyally served Rotath and tended to follow his will. Some of them, such as Xeethra, had aspirations of power, and others, such as Thasaidon, could recognize when Rotath was simply using them for his own ends. Anaxor demonstrated only savagery. While no female Ape Lords were seen (and it is not certain that they exist), it is more than once stated that Ape Lords do not find human women attractive; however, deviant behavior has shown up in the occasional Ape Lord who has sought relations with a human woman. History: The origins of the Ape Lords are unrevealed. Some humans have been transformed into Ape Lords by Rotath, but it is not certain whether all Ape Lords are transformed humans, or whether they originate from some other being (see comments). 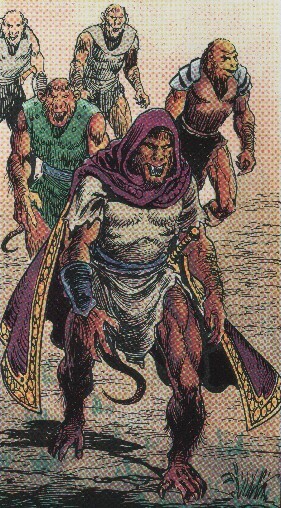 The Ape Lords became servants of Rotath of Lemuria. (Conan: The Ravagers Out of Time (fb) - BTS) - Rotath the Ape Lords to forge weapons to oppose their enemies in the kingdom of Valusia. The Ape Lords enslaved humans and forced them to help build the weapons. (Conan the Barbarian I#37 (fb) - BTS / Savage Sword of Conan#231/3 (fb) - BTS) - When Rotath traveled to an isle of the western Lemuria to study arcane mysteries, King Asfodel IV sent a message to "Lemuria of the West," ordering an expedition be sent to slay him far from his temple (where his powers were greatest). As the ship sailed to the pirate haven to give the orders, one of the men jumped ship to bring the news to Rotath. 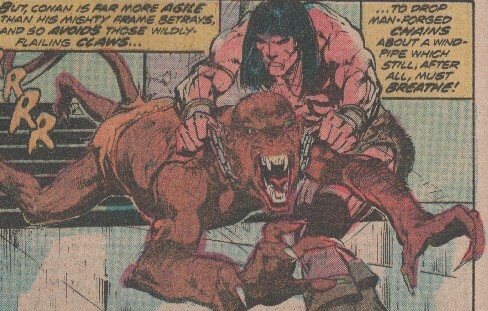 (Savage Sword of Conan#231/3) - Rotath's Ape Lords captured and brought before him a man who had jumped ship. After sharing the information, the man asked for a reward, and Rotath granted him the greatest reward: to serve Rotath for the rest of his days, as one of his Ape Lords. Xeethra and Rotath discovered the veracity of the man's words. Rotath used his Moonstone, a sacred ancient icon brought from his Lemurian temple, to view the Lemurian pirate galley approach and then send a legion of winged demons to attack the ship. Kull and a wolf-man imprisoned on the ship escaped the demons. (Savage Sword of Conan#232/3) - Rotath dispatched his Ape Lords to slay Kull and the wolf-man after they arrived on the isle, instructing Xeethra to keep the newest Ape Lord near to his side. One of the Ape Lords attempted to spear Kull from behind, but missed and was slain by Kull. (Savage Sword of Conan#233/3 / Conan the Barbarian I#37 (fb) - BTS) - Rotath chastised his Ape Lords for failing to slay the intruders, and Kull -- listening in from above -- slipped from his perch and fell amongst them. Though holding his own initially, Kull was overwhelmed by superior numbers until the wolf-man arrived to help him. The wolf-man fought the Ape Lords, casting Xeethra over a cliff and ultimately slaying the other two. Kull tackled Rotath and shattered his Moonstone, who summoned more ice-demons from his Moonstone to oppose him. Kull, however, tackled Rotath and shattered the Moonstone, and with its destruction the ice-demons faded from existence. Rotath then began to turn Kull into one of the Ape Lords, but Kull refused to succumb and rushed Rotath, running him through with his sword. Kull left Rotath, thinking him already dead. (Conan the Barbarian I#37) - Rotath perished, though his spirit was stored within his golden skeleton and later took possession of another man's form circa 10, 000 BC. (Conan: The Ravagers Out of Time (fb) - BTS) - Xeethra, lord of the Ape Lords, made certain Rotath's bones were left undisturbed and that Rotath's rites and rituals were maintained as they awaited the promised day of his return. (Conan: The Ravagers Out of Time) - Rotath, in the form of a giant golden slug, transported itself, Conan, and Red Sonja back to the pre-Cataclysmic era, arriving years after his physical form's death. Returning to his citadel, Rotath retook command of his Ape Lords, had them capture Conan and Sonja. Learning that Kull had become king of Valusia, Rotath plotted to wipe out two enemies in one assault (Kull and Valusia). Rotath instructed the Ape Lords to complete the weapons they had started long ago in hopes of conquering Valusia, and their activities were reported to Kull by his ally Brule, and Kull led his Black Legions, Red Slayers, Pictish allies, and some mercenaries to meet them in battle. The imprisoned Sonja tried to convince her Ape Lord guard, Thasaidon, that the Valusians far outnumbered and would overrun them. When Thasaidon countered that Rotath's magic would protect them, Sonja argued that Rotath's magic could not protect him from a lone barbarian's sword. Thasaidon refused to listen to her any further. By threatening to harm Sonja (via his telepathic & kinetic powers, and/or allowing his Ape Lords to have their way with her), Rotath coerced Conan to sneak into the Valusian camp and abduct Kull. Ambushing Kull outside his tent with a club, Conan indeed captured Kull and donned his robe and crown to fool the guards as he left the camp. Conan returned with Kull, and Sonja showed him that they were his old allies from a previous time-traveling adventure. Wishing the most powerful form for himself, Rotath (via holding Sonja hostage) forced Conan to battle Kull, who fought back to save his own life. Kull tossed away his crown in mid-battle, and Xeethra donned it, proclaiming himself the newly crowned king of Valusia. After a lengthy battle, both Kull and Conan were bloodied and weary with no end in sight. Finally Conan hurled his axe at Rotath, barely harming him, and he and Kull prepared to face Rotath together. As the Ape Lords rushed to meet the approaching Valusian hordes, Sonja fought to break the chains that bound her, and Gonar (his pre-Cataclysmic incarnation, an advisor to Kull) drew a symbol in the dust and began chanting to gods for power. One of the Ape Lords, Thasaidon, who realized that Rotath was just using them, helped free Sonja, only to be consumed by Rotath seconds later. Rotath proclaimed that he would gladly sacrifice all of Thasaidon's apish race to regain his own human form. For each Valusian the Ape Lords slew, one of their number fell in battle; it became clear that Rotath's promised magic would not carry the day for them as the Ape Lords, already in the minority, began to dwindle to a mere few. Seemingly the last of the surviving Ape Lords, Xeethra fled, begging Conan to save him and promising the crown of Valusia in exchange, but Conan cleft Xeethra's head from his neck with a single swordswipe. Gonar completed his spell, adding in the temporal energy held by the time-traveling Sonja & Conan, and offering the souls of all those slain in the field of battle (especially the Ape Lords) up to Valka, and the giant slug exploded, leaving behind only Rotath's inert golden skeleton. Conan and Sonja returned to the Hyborian era and were rejoined by the Hyborian Gonar. (Conan the Barbarian I#37 (fb) - BTS) <10, 000 BC> - Rotath gathered (or created) Anaxor and several other Ape Lords. (Conan the Barbarian I#37) <10, 000 BC> - A tribe of Turanian Hillman captured Conan and Juma, as well as princess Yolinda whom they had been guarding. They were brought to Rotath's castle in the Valley of the Sun. Upon arrival, Anaxor (presumably a descendent of the Ape Lords) grabbed Yolinda and rushed to lay her at Rotath's feet. Conan rushed to save her, and his countenance reminded Rotath of Kull. Enraged by the memory, Rotath swore that none of the arrivals would leave the tower again: Yolinda was to serve as the chain that bound Rotath to the throne of Turan, while Anaxor would slay Conan. However, Conan instead slew Anaxor and then attacked Rotath's guards. (Conan the Barbarian I#37 - BTS / Savage Sword of Conan#234 (fb)) - Conan and Juma were captured by Rotath and sent to work in his mines, while Yolinda was held hostage. Rotath commanded his Ape Lords to guard Yolinda but not to touch her, and most of the Ape Lords would no sooner have mated with Yolinda than with a true ape...most, but not all. One of the Ape Lords, "Zekkir," entered Yolinda's chamber and raped her. (Savage Sword of Conan#234 (fb)) - Though she tried to pretend this wall all just a bad dream, Yolinda found she was with child after returning home. She traveled to Kherdpur to give birth in exile, and she bore twins, both monstrously mutated: the daughter Zosara and the son Salbatanu. adapted by Roy Thomas and Neal Adams. Ravagers Out of Time is a Marvel Graphic Novel. Gorilla-Man (Ken Hale) - Agents of Atlas, SHIELD's Howling Commandos monster force, discovered and killed legendary Kenyan gorilla-man, resulting in his transformation into the new gorilla-man. Either descended from or a survivor of the Ape Lord of the pre-Cataclysmic era, OR a human turned into an Ape Lord by Rotath, Anaxor served Rotath in the Hyborian era. He snatched Yolinda and brought her to Rotath and then attacked Conan at Rotath's orders. The Anaxor was more powerful, Conan caught Anaxor in his chains around his neck and used them to break his spine, killing him. Anaxor was only heard to speak in the form of growls. Serving Rotath upon his return to the pre-Cataclysmic era (at least), he was warned by Sonja that Rotath neither cared for nor would use his magic to help the Ape Lords defeat the Valusians. As the battle turned against the Ape Lords, Thasaidon freed Sonja from her chains but was consumed by Rotath's giant golden slug form seconds later as punishment for his betrayal. Note: In Conan the Savage#10, the Hyborian era necromancer Vacharn worked in a chamber behind an arras (tapestry) marked with the arcane symbols of the archfiend Thasaidon. Nothing further is explained, including whether this Thaisadon was directly or indirectly connected, or completely unrelated to the Ape-Lord Thaisadon. Xeethra served as leader of the Ape Lords, serving Rotath both before his death and upon his return. 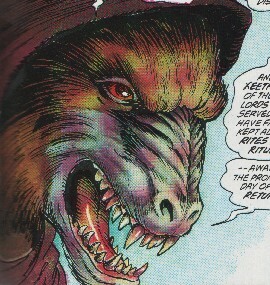 He served Rotath on the Lemurian isle and was cast off a cliff by an unidentified wolf-man allied with Kull. After Rotath's return, Xeethra claimed Kull's crown after Kull had cast it off in battle with Conan, and Xeethra proclaimed himself the newly crowed king of Valusia. As the Ape Lords were wiped out by the humans, Xeethra rushed to Conan, begging Conan to save him and promising the crown of Valusia in exchange, but Conan cleft Xeethra's head from his neck with a single sword swipe.